Haha, it made me laugh anyway! Now I know how to spell it! "A lot of life is a lot of crap"
What you are forgetting, or perhaps didn't know, is that it was during HWSRN's tenure that wing patches were removed / made optional from dress and field uniforms. Not exactly the kind of action that would indicate he was intending to redesign every patch in the country. When I joined CAP in 2005, Penyada was still the Commander, and at the time, Wing Patches were still required. It wasn't until a couple years later that wing patches were deemed "optional." Do you go around asking people to cite them selfs on everything? Is that your purpose in life? You have to understand here sir, that not EVERYTHING is written down on public documents for everyone to see. Cadet Caldwell, the world is going to be a very exciting place for you unless you check your attitude a bit when discussing things you know little about with adults. You may live in a Facebook world of high drama and low grammar skills, but in the real world of business and the military, people do not accept statements made as fact "because you said so". And yes, when people say things to me that sound ridiculous or misinterpreted, I ask for substantiation. I'm sorry to be rude, but I call it as I see it. Your behavior here and continued confrontational responses speak otherwise. [Hmm, I dont think the Foothills Cadet Squadron is using this patch right now. I think they have a shield. I saw a few of their cadets recently and their patch was more black if I recall correctly. He was Region Commander at the time USAF told CAP to remove the shoulder patch from blues uniforms, but said nothing about BDUs. The memo regarding removal of Wing patches from blues was dated 15 March 2006. HWSRN was appointed National CC in July of 2005. Removal was based on a request from CAP, not a directive from the USAF, and was enacted at the National Board Meeting on 4 March 2006. 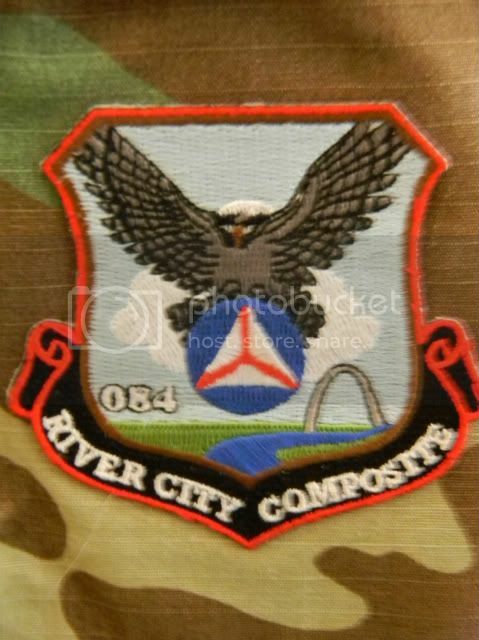 Removing the patch from BDU's was not settled at that meeting. "COL HODGKINS, SR AF ADVISOR, stated that if the board decides to eliminate wear of patches on the blue uniform, he would need to seek Air Force approval." Hardly CAP being "told to remove them". COL HODGKINS/CAP-USAF/CC apologized for his earlier statement and stated for the record that on the question of whether CAP wears the wing patches "or does not wear the wing patches the Air Force is officially neutral on that CAP decision "
Yeah, I think your right. I might be thinking of their old one. I've always liked this one. Odds are if you're in central/east Missouri wing you've seen it around a couple times. Apparently the border colors are the colors of the school they meet at, which is pretty smart! Anyone see the Yokota Cadet Squadron patch in this month's Volunteer......that is a cool patch IMHO. I can see two things "wrong" with the design. By convention Squadrons use round patches and it has the infamous "Triangle Thingy"! Is that even the proper name of the squadron? Don't see one by that name in the last capwatch database that I downloaded down to the "organization" table level. Plus, it should have "SQ" or some variation indicating the unit level. Another thing is we have no qualified ES people, so "search and rescue" ain't going to happen. No it isn't our actual name.